Disney Babies Blog: Blogorailing Favorite Resort! Welcome to those of you joining me from the 2nd Stop ~ YourFirstVisit.net and those of you just hopping aboard. I am the 3rd on our Magical Blogorail Teal! My favorite Disney resort is one I love to visit, yet have never seen the inside of a room. I have no immediate plans to stay there, either. But, I adore Disney's Boardwalk Resort. It has both a hotel and DVC property. The lobby is adorned with beautifully ornate furniture and a miniature carousel. Walk down the halls towards the lounge (which I've heard is a wonderful place to spend time.. if you're there not pregnant or with children, which I never have been) and you'll find several of the old penny arcade turn-the-wheel movies. I remember watching those on Main Street, U.S.A. as a child and I was incredibly excited to know they're still around! If you don't like Greek food, this might not be the place for you, but if you're a fan of moussaka, hummus, and spinach pie, step right up! Oh, and the Avgolomeno (lemon soup) is ridiculously amazing. I've tried making it at home, tried it at other restaurants, and never found anything like it! A big bowl of lemon soup. Yum!! After a nice dinner, it's always fun to walk around the Boardwalk and take in the entertainment! One of our traditions is to step into a photobooth and get pictures together. Or, walk down towards Jellyrolls, the piano bar, or The Atlantic Dance Hall and stop to play some Boardwalk style arcade games. Also at the Boardwalk: an art gallery, a brewery, the ESPN Club (you won't miss a minute of that important game - toilets in the restrooms), a ginormous store with everything from groceries to clothing, bikes, entertainers, and more! The Boardwalk is a short boat ride away from Epcot and Hollywood Studios, but also has standard bus routes! 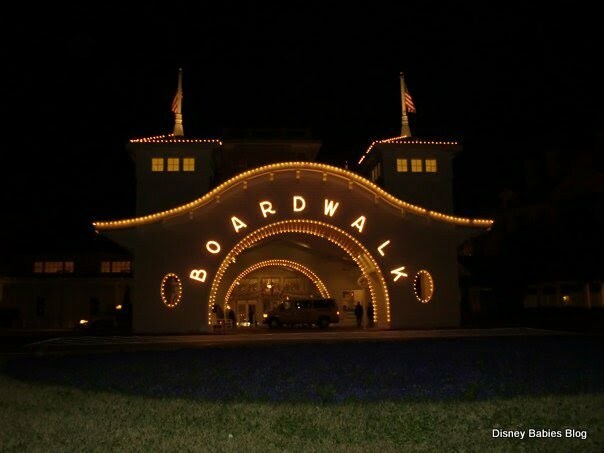 Make sure to stop by the Boardwalk on your next trip!! Thank you for joining me today. Your next stop on the Magical Blogorail Loop is Pursuing the Magic. We spend a lot of time walking along the Boardwalk, but have yet to actually walk inside. I will be adding that to my "must do" list for my next trip! Jenn, I love the BoardWalk, especially the interior rooms in the BoardWalk Inn!